I did not know him personally but when I was feeling uninspired, his photos and captions would convince me to get up, go outside and explore the world – from cycling to places in Melbourne I’d never been, to just going for a relaxing stroll around the block. Alan found humour and diversity in everyday Australian suburbia. The sorts of places many of us would never go out of our way to visit unless we had to, Alan would travel there and discover something new and unique. He will be missed. RIP Alan, 1914-2008. Mon 2008-04-07: Home to Moorabbin following the train line, to Gardenvale along the Nepean Highway bike path, then towards the beach to Elwood, to Port Melbourne, finishing in Southbank. Total: 63 km. Sun 2008-04-27: Home to Baxter, train to Bittern, then cycled from there to Merricks Beach (with a detour to Mooradoo station), then turned around and cycled back to Somerville on the Westernport trail. Total: 70 km, on a mountain bike. Sun 2008-05-04: Home to Carrum, then through Patterson Lakes along the Dandenong Creek trail, then to the eastern end of the Dandenong bypass trail in Dandenong South. Head back the way I came, taking a detour at Parkmore Shopping Centre in Keysborough for a drink, then back down the Dandenong Creek trail to Carrum station. Train home. Total: 62 km, on a mountain bike. Sun 2008-05-11: A long ride, this one. Left home at about 12:30, just after lunch. 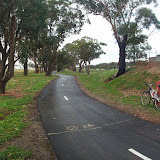 Cycled from home to Frankston, train to Carrum, Carrum to Noble Park North along the Dandenong Creek and Eastlink trails. Eastlink trail locked at Oakwood Avenue. 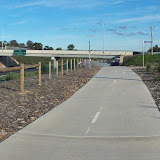 Detour north along Gladstone Road, then Outlook Drive, crossing over the Dandenong Creek trail, across a short unnamed path that meets up with Timbertop Drive (steep!) in Rowville. Head north on Stud Road, then east on the Ferny Creek trail in Knoxfield to Upper Ferntree Gully, arriving in Belgrave at nightfall. Two trains home. Total: about 70 km, on a mountain bike. Sun 2008-06-22: Home to Frankston, got the train to Bentleigh, cycled from there to Caulfield following the train line. Caulfield to Windsor along Inkerman Street. Windsor to South Yarra through some back streets in the rain. 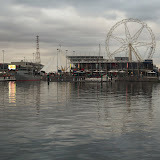 South Yarra to Footscray via Kensington. Train home. Total: 47 km. Stage #1: Home, Frankston, Seaford, (Dandenong Creek trail), Carrum, Bonbeach, Patterson Lakes, Bangholme, Dandenong South, (Eastlink trail), Keysborough, Noble Park. Stage #2: Oakleigh, Hughesdale, Murrumbeena, (Boyd Park trail), Malvern East, (Gardiners Creek trail), Glen Iris, (Ferndale Park trail), (stop at Glen Iris Rd milk bar/cafe for a Coke and Mars bar and admire a recumbent trike), Ashburton, (Anniversary Outer Circle trail), Camberwell, Canterbury, Deepdene, Kew East. Stage #3: Kew, Hawthorn, Burnley, (Yarra trail, north bank), Toorak, South Yarra. 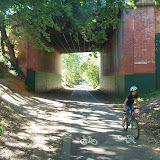 Home to Beaconsfield via Dandenong Creek and Princes Highway trails. Good strong tailwind for about half of the way. 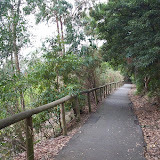 Stage #2: Melbourne, (Yarra trail), South Yarra, Toorak, (Gardiners Creek trail), Kooyong, Malvern, Glen Iris, Malvern East, Murrumbeena (Boyd Park trail), Carnegie, Ormond. 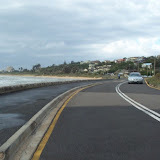 Home to Dromana (via Nepean Highway) and return (via The Esplanade). 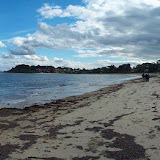 First railway development to the Mornington Peninsula was when the railway opened from Melbourne to Frankston in 1882. Mornington Junction (Baxter) section was completed in 1888 and it went on to Mornington, Hastings and Stony Point in 1889. Without transport to get produce quickly to markets, local settlers were agitating from 1882 for the railway to be extended further south, but it was another 39 years before their dreams were realised. 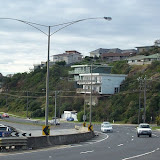 Victorian State Government passed the Bill authorising the Bittern – Red Hill construction in 1915 but it was not until after World War 1 had ended that work actually started. The first sod was turned in Balnarring on 9th July 1920 and a banquet was held in the Balnarring Hall afterwards. Construction to Balnarring was mainly by picks, shovels and wheelbarrows, but from there up the hill it was by 60 men and 6 horse teams. The line from Merricks has a grade of 1 in 30 and 12 chain curves, which is the maximum for broad gauge track. A crowd of 700 people greeted the first train, D980, and after the opening ceremony conducted by the State Minister for Railways, Mr. Barnes, the train made a return trip to Merricks. The Red Hill Station is 631 feet above sea level and 51 miles from Melbourne. The ribbon was held by two Red Hill citizens, the oldest, Mrs. Haig who had celebrated her 92nd birthday the day before, and the youngest was Mary Forrest. Mr. Richard McIlroy who was president of the Red Hill Fruitgrowers Association said that "this ribbon was all that separated the local fruit growers from the markets of the world." In 1924 it was intended to take the line on a further four miles to a site opposite the Baldry’s road intersection with the Mornington – Flinders Road just north of Flinders. The development of road transport of both passenger and goods traffic made further rail extension unnecessary. Even though it had been surveyed, the Government of the day decided not to continue. As the Cool Store had a suction gas engine, charcoal was burnt in a retort to make the gas for ignition. In the months prior to the train coming, this charcoal was transported from Bittern by horse wagon. At least two local farmers supplied locally burnt charcoal. Refrigeration method at the time used brine. The Cool Store was destroyed by fire in 1929 and the new building later housed a Ruston-Hornsby diesel engine driving a Werner compressor and using ammonia as a refrigerant. The new building and adjoining packing shed saw hundreds of thousands of cases transported to Melbourne and overseas markets. The packing shed was leased to the International Fruit and Mercantile Company in 1932. During World War 2 this complex was the local headquarters of the Australian Apple and Pear Board and employed a large number of fruit packers and handlers. All local apple and pear production went through these buildings during this period and when times came back to normal it remained a large centre of industry and a source of employment now long gone. Post war beer shortage saw the development of a press crushing apples for apple cider. Near the end of World War 2 potatoes were railed from Melbourne to Red Hill for HMAS Cerberus and stored in the Co-op Cool Store. Sailors came and transported them back to Crib Point at regular intervals using a vintage Thornycroft truck. The building which used to be the Cool Store still stands today. In August 1924 a rail motor was trialed and it had difficulty on the hill. An AEC Motor Train took over from the steamer in 1925. By 1929, passenger traffic had slowed and the regular train was discontinued and the service reverted to a weekly mixed train on Mondays. This usually departed Bittern at 11:00am ad arrived red Hill at 12:30pm, returning from Red Hill 2:45pm and arriving Bittern 3:35pm. These times slightly varied over the years.